Our new favorite website is here. The simplicity of that is magnificent. Just a calm, simple two words that indicate hell is about to be unleashed on anything carrying a football not wearing the Gamecock garnet and black. And it wears number 7. For some reason that short phrase hit me on the way to work this morning and made me LOL. And I don’t LOL much ever. 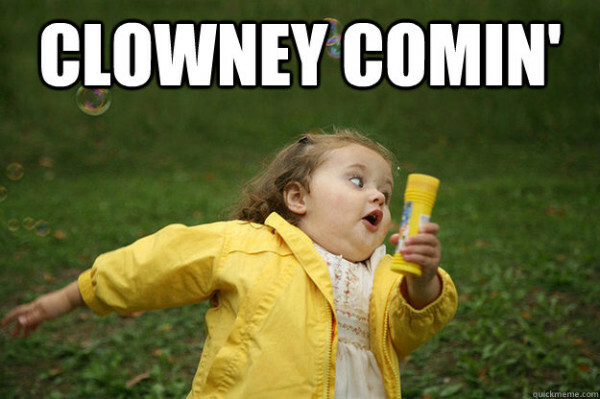 This voice in my head – an old southern gentleman, probably some type of a farmer who has seen bad times and don’t likely scare easy – calmly utters this simple phrase…Clowney comin’…and mayhem ensues. People run for cover, falling all over each other to find refuge under a bed or behind a parked car or in a hall closet. They know he’s comin, and it ain’t gonna be good. So PPP had the idea for the Tumblr site, and I immediately thought of DJ Swearinger Photoshop master George Stevens (@Jorge_Stevens), and those two birthed the site, which is magnificent. Kudos guys, may it live on forever. I tweeted it after Clowney said, “”100 percent Saturday. Put that in the paper.” in the week before the Clemson game. Please enjoy until #7 leaves us or I run out of ideas, whichever comes first.